"Liceo Tacurí" was founded in 1981 at Cali, by ASPAEN ("Asociación para la Enseñenza), the organization set up in Colombia by the Opus Dei movement. The institute is named after a Quechua word meaning "lively"
Blue represents the love for truth. Institución Educativa Técnica Ismael Santofimio Trujillo, initiated in 1982 in borough La Gaviota (Ibagué, Tolima Department) as a satellite of Instituto Técnico Femenino del Jordán, was established on 25 May 1988 by Ordinance No. 496. In November 2002, Decree No. 1,360 merged the institute with Escuela Rodrigo Lara, Escuela San Vicente de Paúl, Centro Nocturno La Gaviota and Escuela Rural de La Pedregosa. The flag of I.E.T. Ismael Santofimio Trujillo is horizontally divided green-white-red. "Unidad Educativa Municipal Instituto Técnico Industrial" was founded in Fusagasugá, Department of Cundinamarca, on 27 September 1999 (Decree No. 812), succeeding different schools founded in the municipality since 1936. The flag of the institute, as shown graphically and described in the "institutional educative project" of the institute, is horizontally divided blue-white-red, with the emblem of the institute in the middle (not shown on the drawing but explicitely mentioned in the text). The flag was designed by the educational community in 1983. White represents tranquility, peace, calm and serenity required to think. Red represents love, friendship and mutual help among the institute community. The main elements of the emblem of the institute are described but their arrangement is not shown. A book represents science, culture, education and development. An Olympic torch represents strength. A square, a hammer and an anvil represent the different technical skills taught in the institute. The emblem is bordered by a red stripe charged with the motto of the institute, "Lealtad, Ciencia y Tecnica" (Loyalty, Science and Technic). Institución Educativa Municipal Técnica Teodoro Aya Villaveces is located in Fusagasugá (Cundinamarca Department). The flag is described in Article 13.1.2 of the institute's Etiquette Guidebook as horizontally divided dark green-white-red. Green is a symbol of the youth. White is a symbol of the juvenile minds of the students. Red is a symbol of joy. Unidad Docente Instituto Comercial Teófilo Roberto Potes (Icoterpo) was established in Buenaventura (Valle Department) by Decree No. 970 of 12 August 1975, originally as a secondary seat of Liceo Feminino del Pacifico. The flag of Icoterpo is horizontally divided light pink-green. Pink is the colour of commerce and of the values of the institute: responsibility, commitment, creativity, love and respect for God. Green is the symbol of the extended forests of the Pacific region. Colegio Terra Nueva was established on 27 August 1991. Classes started on 1 February 1992 in Guaymaral. In February 1997, the school was transferred to the Potrerillos estate, La Aurora borough, La Calera (Cundinamarca department). The flag of Colegio Terra Nueva is horizontally divided blue-green. Blue represents the water resources, source of life and knowledge, hope in a better present and future. Blue also recalls the eternal firmament, immense and full of opportunities, like life. Green represents the plant resources characteristic of the country, which we have to preserve and maintain, sowing in Tierra Nueva seeds of love, tolerance and peace. Institución Educativa Departamental Tierra de Promisión was established in Neiva (Huila Department) by Decree No. 1,408, adopted on 26 November 2002. The flag of IED Tierra de Promisión is horizontally divided green-white-green. Colegio Cooperativo de Timiza is located in Timiza borough, Bogotá. The flag of Colegio Cooperativo de Timiza is vertically divided blue-white-red (1:2:1) with the school's coat of arms in the center. The flag of Institución Educativa Departamental Técnico Comercial de Tocancipá (Cundinamarca Department) is diagonally divided blue-white by a red ascending diagonal stripe. In the middle is placed the institute's emblem. "Instituto Técnico Industrial de Tocancipá" was created on 26 February 1997 (Municipal Decree No. 001) in Verganzo, Municipality of Tocancipá, Department of Cundinamarca. Classes started on 18 January 1998. The institute has today for seats, in Verganzo, La Diana, Canavita and Buenos Aires. 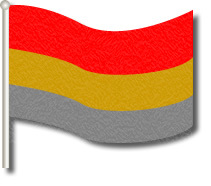 The flag of the institute, as shown graphically and described on the website of the institute, is horizontally divided red-gold-grey, with the emblem of the institute in the middle (omitted on the drawing but explicitly mentioned in the text). The flag was adopted on 31 October 2003 (Decree No. 005). Red represents vital energy and torrent of youth, as well as passion, strength, commitment and permanent sacrifice to learning and life building. Gold represents the human potential of the educational community, as well as its spiritual, social, artistic, technical and material resources. It is the symbol of power, greatness and admiration. Grey represents the metals used in industry, as well as the strength, work, tenacity and constancy of all the members of the educational community. The emblem of the institute was modernized in 2008 by Adrián Eduardo Munar Guarín, Head of the Artistic Education section; the old emblem is shown but nothing is said on its history and designer. The middle of the emblem is made of a grey disk charged with a white open book and a quill, a caliper rule, a square and a pair of scales, all in grey. This is similar to the old emblem, except that the disk was changed from blue to grey to highlight the technical meaning of the emblem. A second, concentric white ring is charged with the red letters "TRABAJO" ("work", top) and "PROGRESO" ("progress", bottom), highlighting the commitment to sacrifice of the community. A third, larger concentric blue ring is charged with the name of the institute, "INSTITUCION EDUCATIVA DEPARTAMENTAL" (white) / "TECNICO INDUSTRIAL" (red) on top, and the name of the place, "TOCANCIPA" (red) on bottom. In the old emblem, all the writings, including the aforementioned motto, were in red letters over a wide white ring. Blue symbolizes knowledge and wisdom. The outer part of the emblem is made of a grey cogwheel. The wheel has 16 cogs, while it had 24 of them on the old emblem. The whole emblem is placed on a square vertically divided red-blue (red-white on the drawing). The size and placement of the emblem on the flag remains a matter of speculation. "Colegio Tolimense", a Roman Catholic institute, was created in 1934 in Ibagué, Department of Tolima, and recognized on 20 November 1942 by the Ministry of National Education (Decree No. 1485). The flag of the institute, as shown graphically and described on the website of the institute, is horizontally divided yellow-green. Yellow represents the spiritual resources while green represents hope. ITFIP (Instituto Tolimense de Formación Técnica Profesional), located in El Espinal, was recognized by the Ministry of National Education on 24 December 1980 (Decree No. 3462). The flag of ITFIP is shown graphically and described on the ITFIP website. The flag is divided white-blue according to the ascending diagonal, with the emblem of ITFIP in the middle. Blue represents democratic identity and collective work. White represents honesty, transparency and knowledge. The diagonal division represents action towards an objective. The emblem of ITFIP is made of a white triangle outlined in green, charged with two dark red and golden yellow overlapping human silhouettes, placed on a circular background in the Colombian national colours (slanted), surrounded by a blue ring charged with the name of the institute in white capital letters, surmounting a blue scroll charged with the ITFIP acronym in white capital letters. The circular shape represents the emergence of universality as an institutionalization of the intellect for the conservation and spread of knowledge. Dark red represents union, strength and constancy. Colegio Distrital Tom Adams is located in the Central borough, part of the municipality municipality of Kennedy (Bogotá). The flag of the institute is horizontally divided blue-gray with a white triangle placed along the hoist. Institución Educativa Tomás Arturo Sánchez is located in Ipiales (Nariño Department). The flag of the institute is horizontally divided red-white-blue. Red is a symbol of freedom. White is a symbol of peace. Blue is a symbol of heavens. Institución Educativa Tomás Cadavid Restrepo was established in Bello (Antioquia Department) by Departmental Ordinance No. 15,166 of 30 October 2002, as the merger of Colegio Tomás Cadavid Restrepo (est. as Escuela Tomás Cadavid Restrepo by Departmental Ordinance No. 39 of 20 June 1947; upgraded to Colegio by Departmental Ordinance No. 892 of 26 November 1999) and Escuela San José Obrero (est. by Departmental Ordinance No. 48 of 12 December 1963). The institute is named for its benefactor, Dr. Tomás Cadavid Restrepo, an historian, philologist and Professor at the Antioquia University, who offered in 1963 a modern dentistry equipment, a selected library and a swimming-pool with its water purification system. The flag of the institute is diagonally divided blue-white per bend, with the institute's emblem in the middle. "Institución Educativa Industrial 'Tomás Carrasquilla' " was founded on 17 August 2007 (Departmental Decree No. 17153) at Santo Domingo, Department of Antioquia, succeeding "Colegio Técnico 'Tomás Carrasquilla' ", founded on 24 February 2000 (Decree No. 034) by the merging of "Colegio 'Tomás Carrasquilla' ", originally founded on 3 September 1927, and "Instituto Técnico Industrial Nacional". The institute is named after the writer Tomás Carrasquilla (1858-1940), considered as the founder of the Colombian realist school. 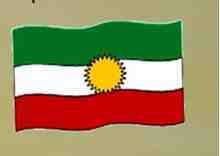 The flag of the institute, as shown graphically and described on the institute's website, is horizontally divided green-white-red with a yellow sun in the middle. The dimensions of the flag are prescribed as 1.50 m x 2.40 m (5:8). Green represents hope and the love for knowledge, work and the natural environment. White represents peace, loyalty, sincerity and honesty, which are the values conveyed by the institute's educational community. Red symbolizes love, dignity and generosity. Colegio Tomás Cipriano Mosquera was established on 15 July 1988 in Ciudadela Comfrandi, a borough of Cali, as Centro Docente Tomás Cipriano Mosquera, by Dr. José Camilo Mosquera Rivas. The flag of the institute, inaugurated in 1990, is horizontally divided black-red-white (2:1:1). The institute's anthem says (2nd stanza): "Black, red and white are the colours Of its nice emblem and of its beautiful flag". Institución Educativa Tulio Enrique Tascón was established in 1963 in Buga (Valle del Cauca Department), as Instituto Técnico Comercial Tulio Enrique Tascón. The institute is named for Tulio Enrique Tascón (1888-1954), the lawyer, historian and politician born in Buga. Elected Senator (1919-1923), Tascón presided the Senate in 1920. He served as Governor of the Valle del Cauca Department (1935-1938). Appointed Director of the Free University, Tascón is the author of "Historia del Derecho Constitucional Colombiano", said to have inspired the 1936 land reform. The flag of the institute is horizontally divided green-white-yellow. Institución Educativa Moderna de Tuluá was established by Resolution No. 1,845 of 5 September 2002, as the merger of Liceo Moderno (originally, Escuela Normal Central Feminina, established by Decree no. 756 of 28 September 1962) , Escuela Santa Cecilia, Jardín Infantil Gabriela Mistral, Escuela Antonio José de Sucre, Escuela Maria Goretti, Escuela Marino Dávalos Grisales, and Escuela Julio Pedroza (Campo Alegre). The flag of the institute is shown in the institute's Institutional Educative Project, as white with two vertical blue lines close to the hoist and the institute's emblem at fly. Institución Educativa Turbo was established by Resolution No. 16.033, adopted on 27 November 2002, as the merger of three schools located in Turbo (Antioquia Department): Escuela Sagrado Corazón de Jesús (est. in the 1950s), Colegio Gonzalo Mejía (est. in 1969 as IDEM - Instituto Departamental de Enseñanza Media), and Colegio de Turbo (separated in 1995 from Colegio Gonzalo Mejía). The flag of IE Turbo is horizontally divided celestial blue-white-emerald green. Blue is a majestic representation of the sea that form the Gulf of Urabá. White, as a neutral color, is a symbol of aspired and achieved peace. Green represents the natural environment.